Dealing with a clogged toilet is no fun for anyone involved. Familiarize yourself with these common causes. Accidentally clogging a toilet can be a big embarrassment, and sometimes they clog even when we haven’t done anything “wrong” (like putting too much toilet paper down it). It can also be an embarrassing (and messy) mishap for the home owner or business owner to deal with. Luckily, there are some things that you can do to help prevent a clogged toilet. There are many things that should never be flushed down a toilet. The short version is that toilets are really only made to flush human waste and toilet paper – nothing else. This means that if you’re flushing down tissues, wipes, dental floss, paper towels, cotton balls, feminine products, or diapers, you’re contributing to the problem. Toilet paper is designed to break down in the water if it gets caught in the drain. So if those other items get stuck, they just stay there, and other stuff builds up behind them causing a big plumbing issue. Homeowners and businesses alike have been converting over to low-flow toilets for a while because of the many benefits they offer. However, some of the earlier low-flow toilets were not as effective as the ones that are available now, and they often didn’t flush with enough force. This would result in not all of the contents of the bowl being flushed away or it not flushing all the way down the pipe. If you have consistent problems, consider upgrading to a newer model. Another possible source of a weak flush, which could be contributing to clogs, is the flapper. The flapper is the part of the flushing assembly in the tank that allows the tank water to flow down into the toilet. When you look in the tank, the flapper is the round rubber gasket at the bottom. If the flapper doesn’t lift high enough when you flush the toilet to let out enough water, this can create a weak flush. This is the easiest problem to fix, however. You can shorten the chain that attaches the flapper to the flush arm, and the flapper will open wider. Finally, the overflowing toilet may be the result of a clog further down in the pipes. 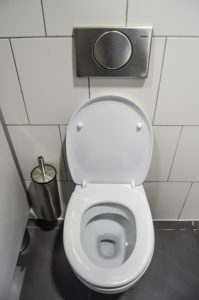 Every toilet has something called the trap: it’s the U-bend where water sits and creates a seal so that sewer smells don’t waft up from your toilet. It is also a prime place for clogs from anything that was flushed down. This entry was posted on Friday, January 25th, 2019 at 5:40 pm. Both comments and pings are currently closed.